"My most memorable moment from the trip was walking down the canyon towards Petra, with the famous Treasury bathed in sunlight in front of us." They travelled with Exoticca in September of 2018. I first travelled to Jordan in 1966, when I was working in construction, and over the years returned many times to work in Amman. It was a wonderful city back then but due to the nature of my trips, I never seemed to be able to get out and discover the sights. I’ve always wanted to return and this tour seemed like an ideal choice as the itinerary promised a good overview of the country and its many historical and cultural sights. 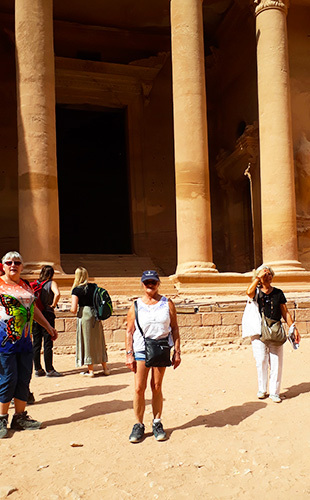 The same day I came across the offer, I picked up the phone and booked the trip for myself and my partner, Lynne, and looked forward to seeing how Jordan had changed over the years and discovering the parts of the country I had yet to see. 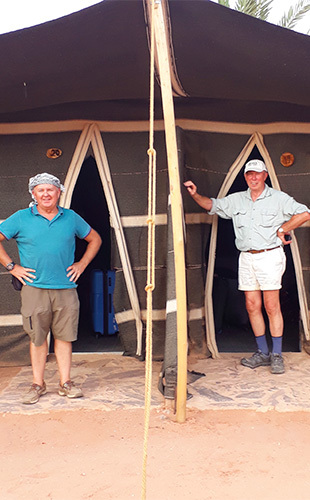 I’ve read pretty extensively about this part of the world and its abundant history had always shone out to me from the pages of the famed Seven Pillars of Wisdom by ‘Lawrence of Arabia’, so I was also keen to see the places mentioned in the literature and the history books. This would be my first ever tour holiday too, having often opted for relaxing at our holiday-homes in Spain and Portugal in the past. On the first read, the itinerary itself seemed pretty full-on and after a long flight and arriving late in Amman, we were met by our guide who arranged for an 8:00 am pick up the next morning to begin the tour. Despite the early morning, I soon got used to the pace of the tour and the coach was comfortable. Whilst other travellers sometimes snoozed on the journeys, I couldn’t keep my eyes off the passing landscapes. The differences are so profound as you leave the bustling cities and head into the vast deserts, bordered by sparse mountains, and I felt like I was finally getting to see the side of Jordan I had missed out on in days gone by. There were 24 people in our group; they were all lovely people who we got on well with. The guide was absolutely brilliant and went out of his way to help us and inform us about his country. 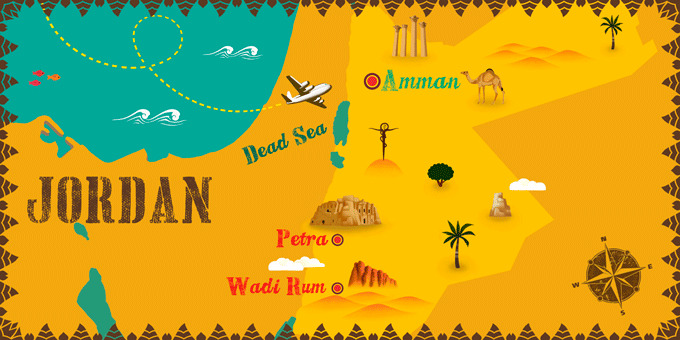 We even stopped at places not mentioned on the itinerary such as the charming port city of Aqaba, which added to the experience. The hotels we stayed in were all lovely, although many of them were ‘dry’, meaning they didn’t sell alcohol. Amman had changed beyond recognition since my last visit. It had really grown in size; whereas once the desert began just a mile outside the city, it was now a good twenty miles until you felt you had left the city behind. The guide was amazed when I recounted tales of the old Amman and even asked me to send him some photos to see the differences himself! I certainly felt like I saw more historical castles, forts and ruins during my week in Jordan, than I had in my entire life! The sights were plentiful and every day provided us with more insight and knowledge into the past and present of life in Jordan. Petra was absolutely awesome and is something you really have to see in real life. The photos you see in the brochure or on television are just a tiny part of the vast ancient city and visiting it you realise the true size and splendour of the site. We also spent a night in the Wadi Rum desert, which was great fun and also included a 4x4 ride into the dunes. The camp was set up nicely with toilets and amenities so it was a comfortable stay under the stars. The Dead Sea was another highlight, where we stopped at a spa resort to enjoy the healing properties of the salty water. I found the weather to be pleasant throughout, with warm sunshine most days. My most memorable moment from the trip was walking down the canyon towards Petra, with the famous Treasury bathed in sunlight in front of us. It was a special moment that far exceeded my expectations and is something I will always look back on fondly. Having worked in the Middle East in the past, I knew what to expect so was not as amazed by the culture or way of life there as some travellers might be. Despite this, I definitely felt like I came away from the trip having gained a good insight into the history of the country and also loved being in the places I had read so much about in the past and feel it all come to life. Booking with Exoticca meant that all the tickets, tours, transfers and other intricate details were taken care of, leaving us to really enjoy the experience. It was good value for money and I am thinking of trying another tour in the future, maybe to Egypt to tick more of the Wonders of the World off of my bucket list! Because Jordan is a majority Muslim country, some of the hotels are ‘dry’ and do not sell alcohol or have a bar. If you fancy a tipple, the local shops sell alcohol, but you might want to remember to bring a bottle opener! Having read the Seven Pillars of Wisdom and literature about the Crusades I felt my experience of Jordan was enriched by seeing the places mentioned in the books in real life. I speak a bit of Arabic already, and knowing a few common phrases is very helpful for speaking with the locals.